Filson Insulated Jac-Shirt. Filson's Insulated Jac-Shirt is a low-profile field layer that provides heavyweight weather protection. An oil finish Shelter Cloth exterior resists wind, rain and abrasion, while 100g PrimaLoft Gold insulation retains warmth even when wet. The front snap closure is easy to use with gloves, and side-seam handwarmer pockets are streamlined and snag-free. 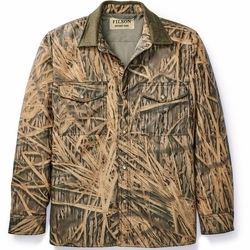 The Insulated Jac-Shirt is part of Filson's Mossy Oak collection.